Disk Defrag is a totally free and extremely fast yet easy-to-use disk defrag tool to analyze, defrag computer and optimize disks for peak performance with an intuitive interface which shows users how fragmented the drives are and displays blocks that are empty, not fragmented and need to be defragmented. 1.The Second Line Button: quick access button to Defrag the selected disk, Defrag a file, Defrag a folder or schedule Disk Defrag by clicking Options. 2.The Upper Box: shows the Drive Name, File System, Capacity, Free Space and other information here. 3.The Middle Box: quick switch button to the current defragging disk state, schedule the Boot Time Defrag, and the report on defrag results. 4.The Lower Box: displays the fragmentation percents, disk capacity, free and used space size, analyzed file amounts and also a list of file fragments that need to be defragged with its path information. Disk Defrag analyses the entire disk and shows the fragmentation percents, disk capacity, free and used space size, analyzed file amounts and also a long list of file fragments that need to be defragged with size and path information. Analysis on file fragments and defragmentation can be finished quickly in less than one minute. It's one of the fastest defragmentation tool with powerful engine. You can click on "Analyze" button or click "File" on the first line button and choose "Analyze" to analyses the disk. Disk Defrag detects all the fragments in seconds and rearranges files stored on a disk to occupy contiguous storage locations, intelligently reorganize most fragmentation for the purpose of speeding up access speed, quickening applications launch, increasing search speed, shortening system startup times and enhancing overall system performance. 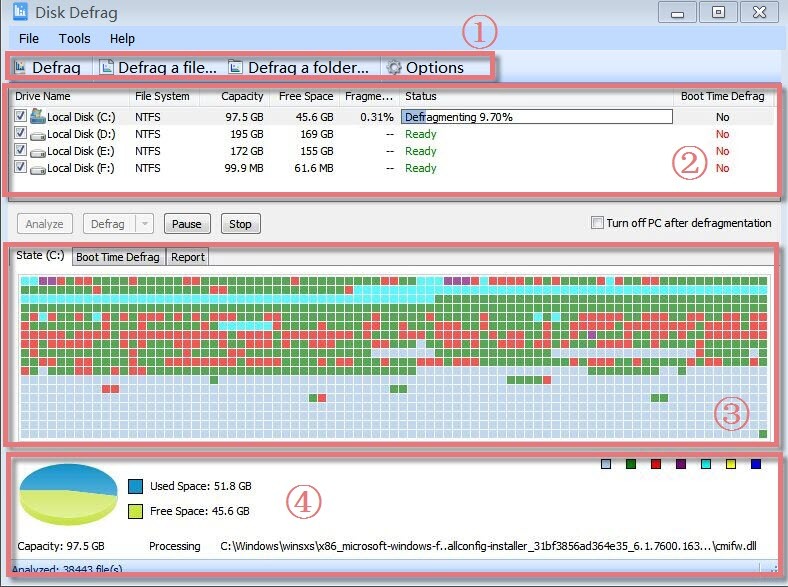 Choose the disks you want to defrag, and then click on "Defrag". You can directly hit the black inverted triangle on the right, or click "File" on the first line button and choose "Defrag" or "Defrag and Optimize(slower, use once a week)". 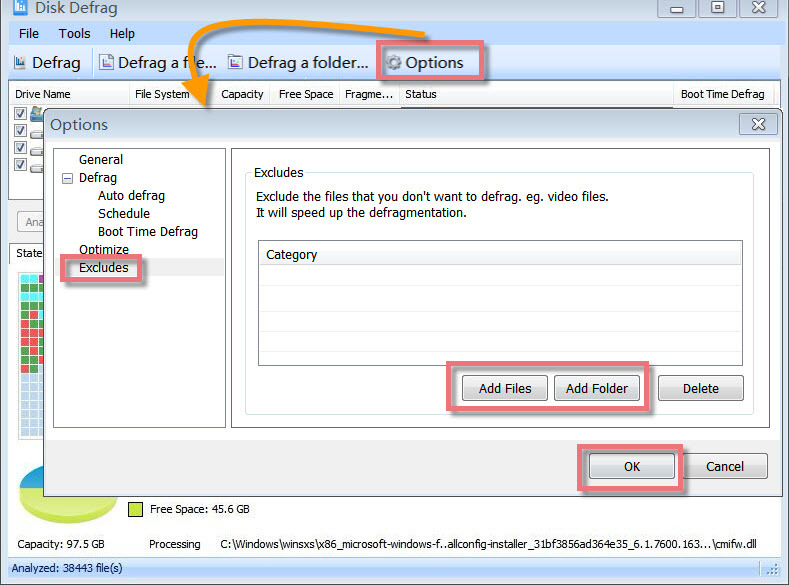 Disk Defrag allows you to integrate itself into Windows Explorer Context Menu. 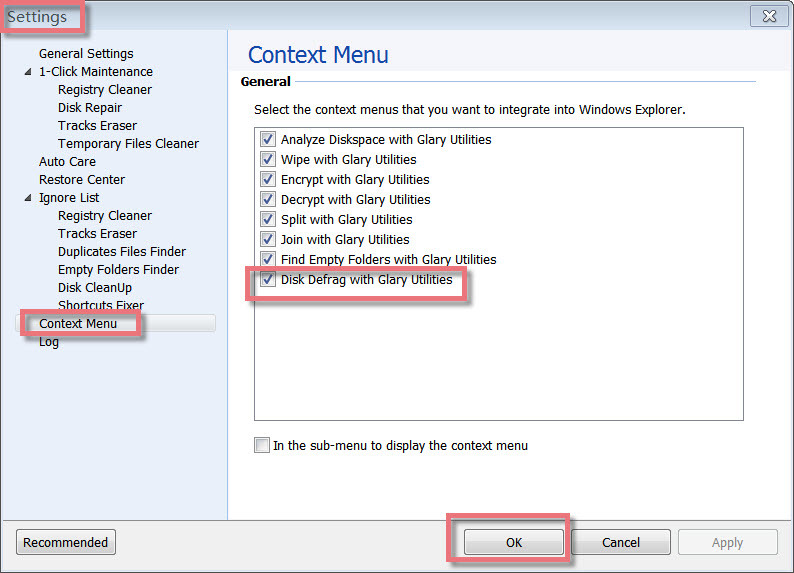 You can open Glary Utilities, go to "Menu", choose "Settings", click on "Context Menu" and check "Disk Defrag with Glary Utilities" option. Finally click "OK" at the bottom of the page. Disk Defrag provides automatic PC care at a user-defined schedule in the background. 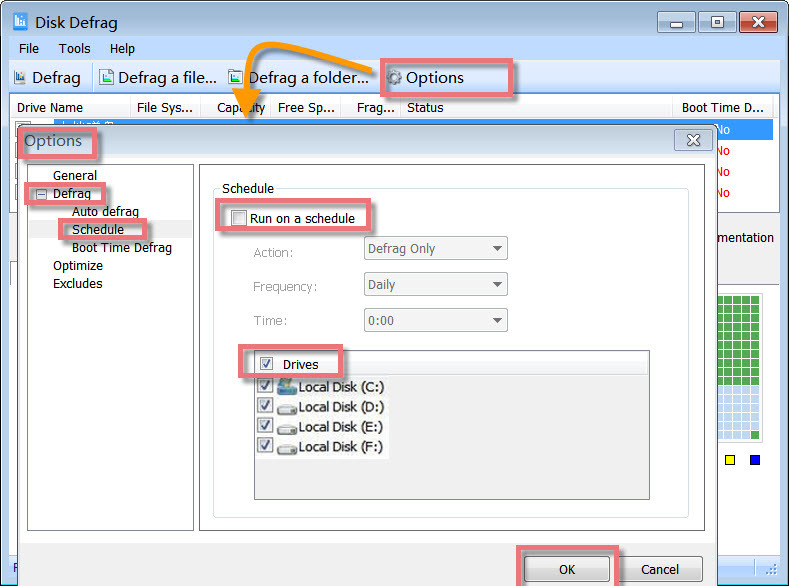 With the schedule preset, you can set up to defrag whenever you like and some other customization features if you want this disk defrag tool to offer. In addition, Disk Defrag is intelligent with more advanced settings to meet advanced requests, such as auto start-up with OS, customizable presets for optimized disk defrag and excludes option for ignoring the specific files and folders that you don't want to defrag. You can click "Options" button and choose "Schedule" under "Defrag" on the left. Select "Run on a schedule", and then choose the "Action", "Frequency", "Time" and "Drives" you want to run on a schedule. If you are satisfied with all the settings above, click "OK". Disk Defrag provides an excluding module for you to create ignore list of files and folders that you do not want to defragment. You can save files and folders to this excluding module easily as well as remove them out. You can find Excludes function by clicking Options button. After you add files successfully, do not forget to click OK button to finish it. Disk Defrag can specify a single file or folder to defrag if you can't wait for entire drive defragmentation. Especially when you want to defrag an installed application or game, or a downloaded video for maximum performance in a hurry, Disk Defrag is a great and flexible helper while many other defragmentation tools only allow entire drive defragmentation. Disk Defrag supports defragmentation to both FAT 16/32, and NTFS file systems and to any other system files such as page file, registry hives, hiberfil.sys file and many other system-locked files. When windows is fully running, defragmentation to system booting files brings faster PC boot. Disk Defrag can shut down your computer automatically after the defragmentation is completed. This avoids leaving the computer unattended while it finishes the tasks and saves electricity and users' time if all the drives are set to defragmentation. Just mark the box before "Turn off PC after defragmentation" if you want to automatically shut down your PC once the defragmentation is finished. Click "Defragment" under Hard disks, Disk Defrag will pop up. Find and click Disk Defrag icon, Disk Defrag will appear. Please note: if you want to add Disk Defrag in the Dock bar, click in Dock bar, remove any icon by dragging it out of the Dock firstly, and then drag Disk Defrag in.